Every calling has it challenges, whether we are teaching or ruling elder, parent or employer—in all life’s walks there are difficulties. Curtis Karns’ are just different from yours and mine. His presbytery of 21 churches covers an area the size of California, Texas and Montana combined. There are no roads to 9 of those. Curtis was born and raised in Alaska, so the wildness, and roadlessness of his home state was the “norm”. Not that he doesn’t understand how it is down here. His seminary training came from Princeton and he pastored in the “lower 48” before returning to his beloved home state. What holds Curtis apart is more than birthplace and beauty. Alaska’s economy is built on extraction and transport of fossil fuels. But a huge number of the congregants he serves live on the edge of the seas that no longer freeze before January, are rising, and have fewer resources for subsistence living. An example is Savoonga a town on St. Lawrence Island where the annual arrival of the walrus provided people with food for the year. In the last few years climate change has thinned the ice, making safe hunting days few and dangerous. Not only are the animals difficult to hunt, the walruses, at the top of the food chain, they have been eating over the last few decades are full of the toxins from industrial waste left behind after WWII, raising the cancer rates for villagers. To minister in Alaska is to hold the tensions of two complexities – fossil fuels with jobs and the deadening effects that industry has on the two and four footed creatures who subsist on God’s sacred lands. As important as that is, it isn’t the thing that makes Curtis an EARTH Keeper. Before he heard the words doctrine of discovery he knew what it was, how it had played out in Alaska[i] and he was wrestling with what “apology” means. When I first heard him speak, long before he knew of the doctrine, he talked about our European arrogance—our belief in Western “rightness”. He put that into action by supporting the Presbyterian community of Gambell as they sought and are seeking to define “apology.” The story is huge because it is, possibly, our first denominational road map to how “apology” works. It is a story you will want to hear for yourselves. Curtis will be at our conference so he can share it, show film of it and teach us about listening. Here is the impossibly short version. Presbyterians flew to snowy Gambell, named the horrors of the boarding schools, read the names of the teachers (many of them beloved by their students), drummed with the elders, danced with the Yupik residents and began to design the church that will replace the condemned building of the past. Where before drumming and native languages were condemned as sin, the new church will be the village’s only community center and it will be the place where people come to have ceremony, drum and speak the language of their ancestors. Curtis told me that “apology” is not what Christians know. Our language for what must happen has two words—Repentance and Reconciliation. And, that is what his life is ALL about. 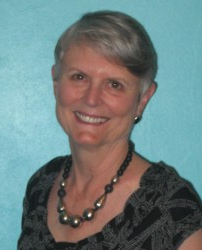 Holly Hallman is the Northwest Regional Representative of Presbyterians for Earth Care. [i] S. Hall Young, sometimes known as the "Father of Alaska Missions," bragged in his autobiography (The Mushing Pastor): "One strong stand, which so far as I know I was the first to take, was the determination to do no translating into the Tlingit language or any other of the native dialects of that region. When I learned of the inadequacy of these languages to express Christian thought, and when I realized ... that the task of making an English-speaking race of these natives was much easier than the task of making a civilized and Christian language out of the Tlingit, Haida and Tsimshian; I wrote the Mission Board that the duty to which they assigned me, of translating the Bible into Tlingit and of making a dictionary and grammar of that tongue was a useless and even harmful task; that we should let the old tongues with their superstition and sin die - the sooner the better - and replace these languages with that of Christian civilization and compel the natives in all our schools to talk English and English only. Thus, we would soon have an intelligent people who would be qualified Christian citizens." Changeable surface, sand, wind, brushes of grass. fluid and clean tonal lilting in attenuated motion. On the surface, removed from image, is an iridescent garment of compassion. Boulders are lapped in flow, voices ascend to the lunar disk. Simple paintbrush bloom, ecstatic, in orange and red. Songs hum in the vocal throat of grace. Sage Brush around the loving fire waits in an aureole of pale courage. Hold still, touch the compact smoldering soil. The flesh of salmon is translucent as flame. Heat and ardor, tender interior, smoke and calm weeds. The fire is a furious matter of watching. a pinpont of vision on movement. Land uplifts the shadow, higher. Sun raises the cottonwood branches from the river's surface. The salmon wait inside rippling light on the reversal of current. The song says, Come or pass. Be weak or strong. Dance on light. Moon is in the color of pale bellies slow turn to sky. on the fringe of grass and water. A brittle sheen of calcium and light combine with radiance. Fine combs of supple and rigid spines rest among the stone. The root, stone, flesh and water. © 1994 Elizabeth Woody, to be published in One Reel project, 1998. 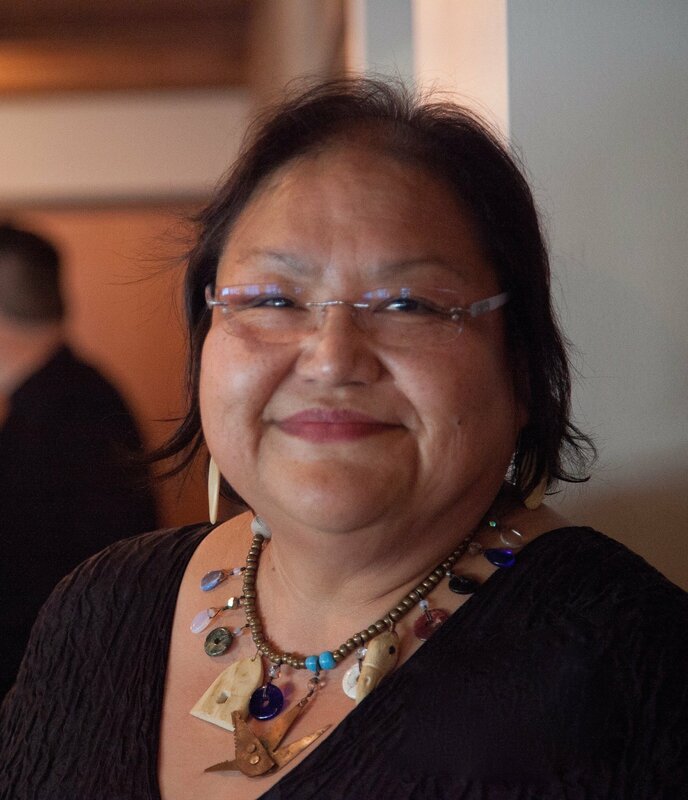 Elizabeth A. Woody is an enrolled member of the Confederated Tribes of Warm Springs, Oregon, of Yakama Nation descent, and is “born for” the Tódích’íinii (Bitter Water clan) of the Navajo Nation. Her paternal grandfather’s clan is Mą‘ii deeshgiizhinii (Coyote Pass - Jemez clan). She received the American Book Award in 1990, and the William Stafford Memorial Award for Poetry and was a finalist for the Oregon Book Awards in 1995. Elizabeth has published three books of poetry. She also writes short fiction, essays, and is a visual artist. 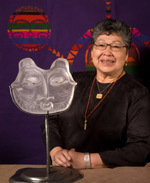 She is a founding member of the Northwest Native American Writers Association. She is currently the Oregon Poet Laureate. Elizabeth Woody will be a speaker on at the pre-conference Spirit of the Salmon event on September 25th for the visit to Celilo Park. She will talk about the Confluence Project, tell some stories important to her people and share poems. The art of a people is a window to its culture and spirituality. In preparation for our "Blessing the Waters of Life Conference," we are pleased to share the artwork of one of the most widely revered contemporary artists of the Columbia River Tribes. Lillian Pitt, a descendant of Wasco, Yakama and Warm Springs people. One of the frequent subjects of her art over the years has been "She Who Watches" a well-known ancient rock painting in the Columbia Gorge. The wide-eyed pictograph has an interesting story behind it. 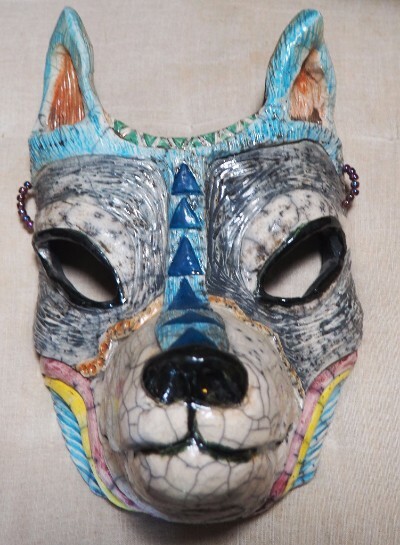 Coyote, known as a trickster, attempted to betray a local tribal leader. A wrestling match ensued and the wily coyote threw the female chief onto the cliff. 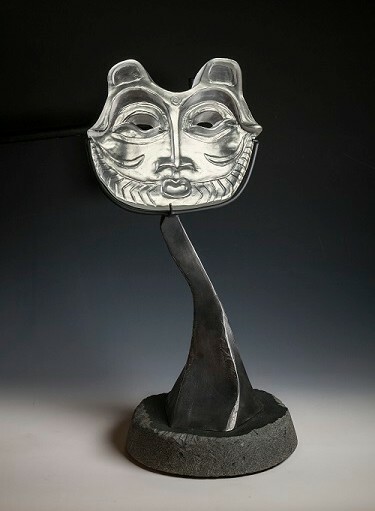 She turned to stone and to this day, "Tsagiglala" or "She Who Watches" the tribe's guardian, watches over her children. 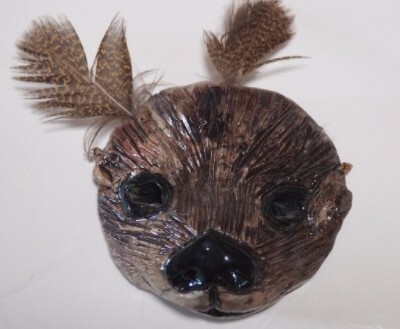 Art by Lillian Pitt, clockwise from top left: Coyote, She Who Watches in Glass, She Who Watches, Otter. All photos used with permission of Lillian Pitt. 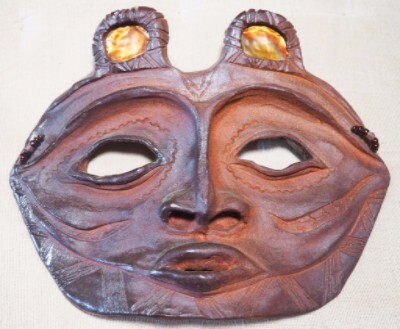 Lillian Pitt is a Native American artist from the Big River (Columbia River) region of the Pacific Northwest. Born on the Warm Springs Reservation in Oregon, she is a descendant of Wasco, Yakama, and Warm Springs people. One of the Spirit’s movements of the past few years has been the linkage of ministry aimed at addressing the renunciation of the doctrine of discovery with ministry aimed at addressing climate change. 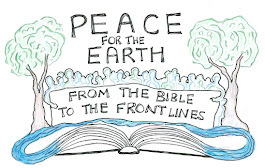 In the Presbytery of Yukon we have held three special events making that linkage, and many others are also engaged in that effort—including the upcoming Presbyterians for Earth Care’s National Conference, Blessing the Waters of Life: Justice and Healing for Our Watershed to be held at Menucha Retreat Center in September. Given all this coordinated action, it is important to show why repentance from the doctrine of discovery fits hand-in-hand with climate change ministry. For some, I believe, the connection will not be obvious. Yet, the two efforts are really the right and left hand of one, integrated focus for ministry. To begin making that point, let me lean on biblical scholar, Matthew Richard Schlimm. Schlimm points out that the Hebrew Bible connects repentance from moral sin with caring for the land. In this, I believe the doctrine of discovery is instructive. This morally flawed doctrine provided western culture with a false and dangerous Euro-Christian ethic for taking land from indigenous people. It also authorized any actions needed to subdue the local residents. In practice this included enslaving them, or shaming them for not being European in language and culture. It is important for us to see that this western worldview rationalizes the creation of colonies, with all the damage that colonization causes, for the purpose of enriching the people from the old world. That being the case, this same exploitative worldview is also quick to rationalize practices that damage God’s creation. Both the exploiting of people and the exploiting of the land are things colonizers do for their own benefit. It is the opposite of “love your neighbor as yourselves.” In essence, it is a refusal to acknowledge the other, whether other people or other parts of creation, as a valid neighbor. Similarly, Americans would love for the climate change problem to be dealt with, but “not in my backyard.” None of our coal, oil or natural gas producing regions want to let go of the profits and jobs fossil fuels bring to their region. The fact that their grandchildren will certainly suffer if they do not seems impossible to grasp. Some are like the citizens at the time of Noah; they simply deny calamity is coming. Others are more like the people of Israel and Judah as the armies of Babylon and Assyria threatened. They pray to God to save them but refuse the prophets’ message that God is calling each of us, and all of us, to take responsibility for our own actions. This is the famous Tower of Babel passage. This passage tells us about humans who were so united by language and culture that they came to believe they could harness the earth’s power to make themselves like God. As they developed their technology and built their tower, God saw their arrogance and sin and decided to take action. God then confused their languages and scattered them across the earth, so that they could no longer build a city of such technology and power. First, God has divided us into many peoples. Therefore, no one people has all the wisdom. In humility therefore, we need to look for the gifts other peoples have to share with us. Sharing, after all, is a biblical value: in sharing together the early church demonstrated a new way of being God’s people; further, it is in our shared unity that we share in the fullness of Christ’s body. "You know that the rulers of the Gentiles lord it over them, and their great ones are tyrants over them. It will not be so among you; but whoever wishes to be great among you must be your servant." (Matthew 20:25-26). Third, the Bible reveals God to us as the Trinity, a relational way of being. We should not be surprised if the modern challenges of the planet also challenge us to learn how to collaborate and cooperate better. In so doing we surely learn more about being created as the image of God. Finally, if the land/sea/air is getting sicker, we should be asking how to respond. How should we repent? It is the repentance of the people that leads to the healing of the land. For Christians, the concerns and ministries related to earth care truly are part and parcel of the concerns and ministries related to the doctrine of discovery. The current crises in each of these areas are consequences of the dominant worldview—a worldview that, unfortunately, shapes its adherents to participate in the exploitation of people and land. For Christians, the concerns and ministries related to earth care truly are part and parcel of the concerns and ministries related to the doctrine of discovery. The current crises in each of these areas are consequences of the dominant worldview—a worldview that, unfortunately, shapes its adherents to participate in the exploitation of people and land. 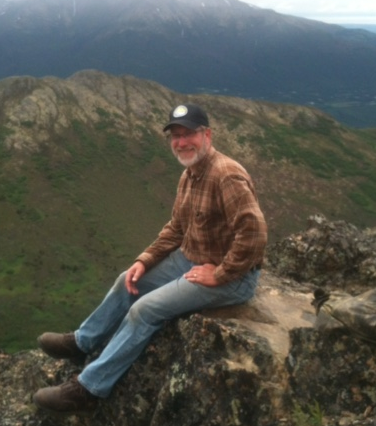 Curt Karns is the Executive Presbyter of Yukon Presbytery and former Presbyterians for Earth Care Northwest Regional Representative. The Renewal and Healing Event in 2017 between the PC(USA) and the Iñupiaq people, held in conjunction with Kivgiq in Utqiaġvik, Alaska. The Hebrew Bible differentiates between ritual uncleanness and moral uncleanness. Ritual uncleanness is not about sin, but about something that happens that requires purification. A good example is the handling of dead bodies. Death is just something that happens; there is no sin attached. Someone has to deal with the dead bodies, risky though it might be, and purification is prescribed. Moral uncleanness is different, however, bringing spiritual dis-ease both to the person and to the whole of creation. Schlimm, Matthew Richard (2015). This Strange and Sacred Scripture: Wrestling with the Old Testament and Its Oddities. (Grand Rapids: Baker Academic, p. 118). There are clearly cultural prejudices involved that we should reject today. For instance, Lev. 27:1-4 clearly indicates that women are only worth 3/5 that of men. Other passages bar those with disabilities from bringing sacrifices (21:16-23), show ignorance of sexual orientation (20:13), etc. Johnson v. McIntosh, 1823, followed by many others up to modern times (e.g., City of Sherrill, New York v. Oneida Indian Nation of New York, 2005). Rick and I arrived at the faith gathering spot for the march, just in front of our nation's Capital, via the Metro. The array of groups in the faith section was broad and it was heartening to see so many people of all faiths together - gathering, meeting old friends and making new ones. There were Indigenous Peoples, Presbyterians, Catholics, Methodists, Lutherans, Hindus, Buddhists, Muslims, secular humanists, pagans who were drumming, chanting and enthusiastically dancing (interestingly assembled next to the Baptists) and more. Amazing to realize we were all committed to advocating for the earth and God’s creation through the lens of our belief. We lined up on 3rd St about 10:30 AM, holding the PEC banner to gather others and wait for the march to begin at 11:00. The numbers in attendance were such that the faith section did not actually start moving until 12:30 PM! Although they estimated over 200,000 individuals were walking, it seemed just as many were watching from the sidewalks and rooftops of many of the buildings we walked by. We carried the banner high through the streets of Washington DC. As we walked up Pennsylvania Avenue we circled the White House and ended our walk about 3:30 PM at the Washington Monument. One moving event we experienced happened at 2:00 PM as the marchers circled the White House. Everyone sat down in the street in silence. We all then executed a heartbeat, for over a minute, to symbolize mother earth’s beating heart. The heartbeat echoed through the silence. The march then continued as all arose and shouted our call to care for the environment. Attending and participating gives us hope that we are not the only ones in this fight and that together we honor God’s creation and WILL make a difference! If there is anything the past few months have taught us, it's that faithful, thoughtful, inspired and informed leadership is critical to living in harmony on our planet. Now more than ever, we are called to confront the fierce urgency of now! 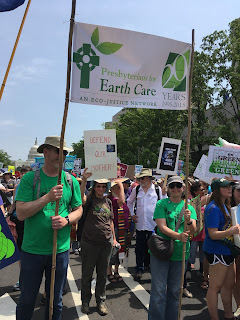 Because you are a member or friend of PEC, you know that we are a national eco-justice network that cares for God’s creation by connecting, equipping, and inspiring Presbyterians to make creation care a central concern of the church. Your time with the PEC Steering Committee can make a real impact! Steering Committee members determine and review purposes and strategies, make decisions about the organization, set policy, raise funds, approve an annual budget and manage the finances. Steering Committee members must be Presbyterian and members of PEC (or willing to become so). The Moderator will have excellent organizational and communication skills and will be experienced at directing a small group of volunteers. The Moderator will devote approximately 40-50 hours each month to leading PEC, the Executive Committee, and the Steering Committee. The Moderator will be willing to travel occasionally on behalf of PEC. Regional Representatives will live in the area they represent and will devote from 5-15 hours per month promoting PEC, recruiting new supporters, and encouraging membership renewals and donations. Representatives may give presentations or promote Earth Care Congregations. We invite you to visit our website as you faithfully consider nominating yourself or someone else you know who has a passion for creation care! Please send your nomination to pec@presbyearthcare.org by May 12.